Encouraged by Cambodia’s policy to establish large-scale agriculture under the Economic Land Concessions (ELC) scheme, and incentivized by the European agreement “Everything but Arms” (EBA) with least developed countries, Cambodia attracted large amounts of investment into sugar production, allowing the country to export their products at a fixed minimum price and without tariffs to the European Union. Investments attracted in this context, caused some of the most depressing land grab conflicts in Cambodia. Among them are the evictions surrounding Phnom Penh Sugar Co. Ltd.’s sugarcane plantations for the production of what some called “blood sugar” (1;5;7). In February 2010, Phnom Penh Sugar Company (PPSC), owned by ruling party senator and business tycoon Ly Yong Phat, was granted an ELC covering 8,343ha in Thpong district, Kamping Speu district. 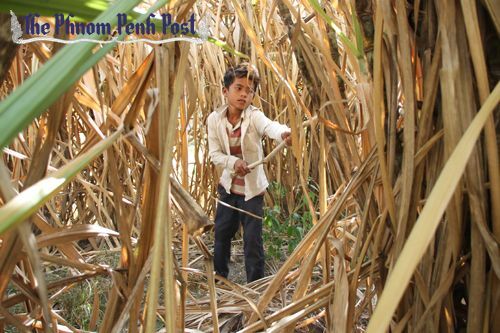 Another ELC amounting to 9,052ha, located in Omlaing commune, Oral district, was granted to the sister company Kampong Speu Sugar Company (KSSC), owned by his wife Kim Hean. On March 21, Prime Minister Hun Sen further signed a sub-decree to classify 4,700ha in the Oral Wildlife Protected Area as an extension of the concession land granted to KSSC. Both companies, which are closely associated and further belong to the same family, control now more than 23,000ha of ELC land, while the legal limit per ELC is set to 10,000ha (2). The procedure and impacts of establishing the sugarcane plantation have been devastating for the local population. Concessions were granted without prior consultation or environmental or social impact assessments. Formally recognized community forests, orchards, farming and residential of around 1500 families from 21 villages located in Thpong and Aoral district was seized and bulldozed backed up by military presence. Villagers were evicted and resettled in areas with lack of adequate infrastructure and productive land and without proper compensation (see project details). Facing food insecurity and a drastic loss of livelihood, villagers were forced to start working on the sugarcane plantation. Low salary required to take children out of school to send also them to work on the plantation as child labour. Working conditions have been dramatically harsh and dangerous; several workers have been killed so far by cane-cutting machines (2). Also the environmental impacts are devastating, including dumping of waste into community streams, which has provoked fish dying, and sickness of villagers and their livestock (2). The evictions were resisted by all kinds of mechanisms, ranging from protests, over small-scale arson and throwing stones on company equipment, to highway barricades (1). Several villagers who protested have been facing lawsuits and trials or have been arbitrarily arrested. Uprising was further largely repressed since the beginning, through police and military presence. In fact, KSSC employed the former Khmer Rouge Batallion 313 as private army to intimidate villagers, to force them to accept completely inappropriate compensations and to protect the concessions land. (2). In January 2014, social and environmental impact assessments leaked to Inclusive Development International (IDI) and Equitable Cambodia, two national NGOs supporting the case, revealing that the supposed ethical banking group ANZ has financed the project with several “tens of millions of dollar” (3), in spite of completely dismissed social and environmental recommendations of the assessment report, which some moreover described as a “whitewash report”, as it did not mention the forced evictions associated to the plantations (2). On behalf of 681 families that were forcibly displaced and dispossessed, IDI and Equitable Cambodia filed on October 6, 2014 a formal OECD complaint against ANZ for financing this devastating land grab (2). Impacts mentioned in the report include the military-backed up forced evictions, violation of human rights, arbitrary arrests and widespread use of child labor (4). Finally, also the EU started to revise its EBA policy and to assess its adverse effects (5). Project Details The concession land has been granted under the Economic Land Concession (ELC) scheme of Cambodia, which provides concessions for the development of large-scale agriculture under a lease agreement of up to maximum 99 years. Lease agreements are commonly set for 70 years (see legal ELC framework, below). The total concession areas are 8,343ha for Phnom Penh Sugar Company Ltd.; 9,052ha for Kampong Speu Sugar Company Ltd., plus an extension of 4,700ha located within the Oral Wildlife Protected Area. The total amount of land under concessions is 22,095ha (1;2). Around 2,000ha of farmers land have been encroached by PPSC (7). A “disturbance compensation” of 25$ per household was offered for the resettlement. Farmers with irrigated rice plots were offered a compensation of 100$/plot (1). A total of around 1500 families from 21 villages has been reported to be affected (3). Based on average household size, this corresponds to roughly 7,000 persons. Villagers who protested, lost their job, were filed or even arbitrarily arrested. Currently around 38 villagers face criminal charges (3). Phnom Penh Sugar Company states to have invested more than 200,000,000$ into the sugar processing facility (6). Relevant government actors Ly Yong Phat, ruling party (CPP) senator, is owner of the Phnom Penh Sugar Comapny Ltd.
Development of Alternatives Villagers faced already large damages. Inclusive Development International (ID) and Equitable Cambodia (EC) estimated that the damages produced to villagers due to loss of farm land and other issues amounts to 11 million dollar of uncompensated losses (3). The NGOs claim that the villagers need to be compensated by the companies as well as ANZ which supported the project. Villager further require help to establish again their livelihoods. To the EU: that EU should investigate impacts; temporarily suspend EBA trade; verify that producers are not involved in Human rights abuses or environmental destruction; ban import of agricultural goods produced on illegally acquired land. To the involved companies: Stop forced evictions; stop destruction of community natural resources; stop using violence against people; return illegally appropriated land; stop using child labor. Why? Explain briefly. The project goes on, in spite of devastating impacts on people and the environment. Accidents due to lack of work security even led to the death of several persons, killed by cane-cutting machines (2). (1) Borras and Franco (2011). Political Dynamics of Land-grabbing in Southeast Asia: Understanding Europe's Role. Transnational Institute.